There's something to be said for standardized hardware, and generally that something is "man, that update came in fast." 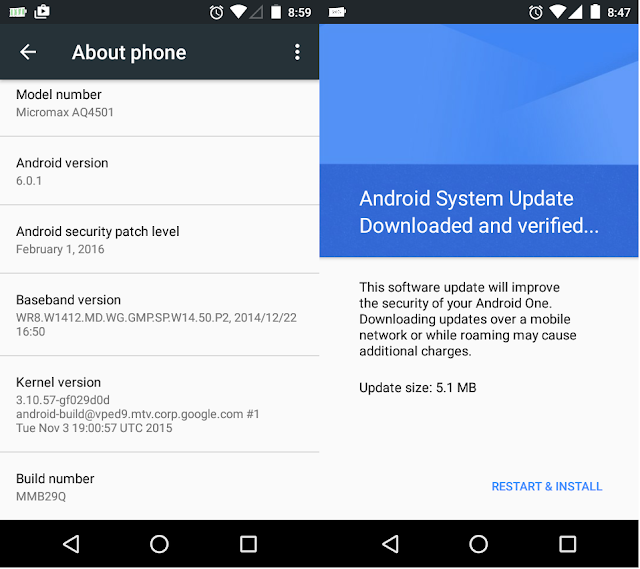 Android One Users, at in INDIA, some Android One phones are being update to the latest version of Android Marshmallow February Security Update of (5.1 MB ). It seems a safe assumption that the update includes bug fixes and improvements to Android Stagefright Security . The monthly security update for January is starting to roll out to Nexus devices. & Android One Devices Simultaneously Factory images And OTA Update. Monday morning and now we've got some changelogs from the Android Open Source Project (AOSP) if you're interested in taking a deeper look at exactly how things have been tweaked. The Do Not Disturb Bug "Until Next Alarm'' reappears only for Whose stock android Rom not modified from it's Major Update Android Marshmallow 6.0.